Before the railroads came, travel was long and hard. The majority of people in the US lived in one place all their lives, only traveling a few miles in any direction. In the middle 1800s, men started building railroads to connect much of our nation. Railroading became a decades-long developing industry. Thousands upon thousands of men worked on the railroads. Some almost like slave labor gangs. Many of the Chinese who emigrated to the US during that time period worked on the railroads. In the plains, building railroads was a fairly simple endeavor, but crossing the mighty mountain ranges was complicated and dangerous. Lives were lost. Fortunes were made by the railroads. The major lines during the last half of the 19th century were: Atchison, Topeka and Santa Fe; Great Northern; Northern Pacific; Southern Pacific; Union Pacific. I'm always fascinated by the women affected by anything historical I study, and I've compiled a few from The Railroaders, from The Old West series by Time Life Books. 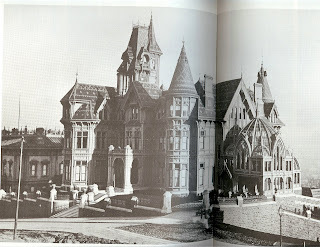 Railroad magnate Mark Hopkins' imposing mansion on Nob Hill in San Francisco was completed after he died in 1878. The house was Mrs. Hopkins' pet project but he dismissed it as the "Hotel de Hopkins." Dumpy and devout, Mrs. Leland Sanford (Jane) looked like Queen Victoria, and sometimes behaved like her. Widowed in 1893, she used her husband's millions to support Stanford University, which he founded. Famboyantly sociable, Mrs. Charles Crocker (Mary) made herself San Francisco's premiere hostess by throwing posh parties ast the $2.3 millon Crocker mansion on Nob Hill, while smothered in satin, brocade, and jewelry. Sometimes the trains were used to carry large parties on outings. But the greatest thing the railroads did was open up the country for more commerce. Not until the trains came, were those in the middle part of the old west able to get lemons, with which they quenched their thirst. Lemonade became an important part of most community socials and even in many homes. And the beef grown on the ranches in Texas could be slaughtered in Chicago and served in restaurants in New York City and Boston. So many new opportunities were provided by rail travel, and although other forms of transport have come and gone in our country, railroads are still a valuable part of our economy. Lots of info surrounding the railroads have produced fodder for my novels. The Old West series is out of print, but you can get used copies of at www.amazon.com . I've ordered only the books I'm interested in. They have enriched my research. I'm having a special giveaway today. I start reading Christmas books near the beginning of October every year. There are so many good Christmas stories that are published every year. So one person who leaves a comment will win a Nook or Kindle copy of The Best Medicine, one of my Christmas novellas that is also about the railroad from Denver to Summit County, Colorado in 1913. Please leave a way for me to contact you in the comment. Have you ever traveled by train? Where did you go? Let us know in the comments. I really enjoyed this post, Lena. My husband and I have ridden a train from Bologna, Italy to Frankfort, Germany. What a wonderful experience! That sounds like fun, Melanie. Davalyn, I'd love to take that train. Lena, thank you for writing this post ~ this is the part I would like to know about further ~ how interesting! Thanks for the mention of Mary in your post. Thanks for sharing that interesting story, Kathleen. I loved and enjoyed your post, Lena. I've never rode a train, but my Mother and I have discussed riding the train in Canada. They say it's beautiful countryside that you will see. Trains are still important for our economy, too. Maybe one day I will be able to take a train ride. Until then, I will live that experience through great novels. Thank you for the opportunity to enter this giveaway and please enter my name. Barbara. I've been wanting to go on one of the Canadian rail tours, too. Hi Lena! Thank you for sharing this fascinating post; I love it! The only train I have traveled on was a Japanese Bullet Train. This was years ago when I was in high school on a student exchange. Hi, Britney. I'd love to go to Japan. I enjoyed hearing the stories about the historical woman and their accomplishments. The first time I rode a train for travel vs fun was in Israel. My husband and I lived there for a year when we were first married and got to ride the train from the Galilee area to Jerusalem--at least I think that's where it was. It's been a few decades since that happened. I'd have loved to be there when you and your husband were. I like Mrs. Leland Sanford who used her husband's millions to fund Stanford U. She picked something that matters. Sharon, maybe you will. I'll go do the drawing. And our winner is: Sharon m. Sharon, should I send you a Kindle edition or an epub edition?